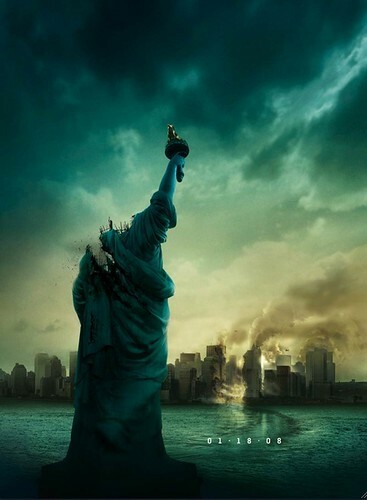 Cloverfield: 6.5 out of 10. My Mayhem in Manhattan week continues. I caught I Am Legend earlier in the week and last night I watched Cloverfield, yet another "anarchy in Manhattan, God help us all" flick. When this movie came out, we were six years removed from 9/11. You can't help but think back to that day when you see things crashing into buildings, buildings falling down and people running for cover to escape blowing debris down the streets of New York. This movie couldn't have been released in 2002.. or 2003 or 2004. The fact we can watch these scenes and find fun in it is a good indication of how far we've come and how successfully we've returned to normalcy. Cloverfield is fun... sort of Blair Witch Project meets Escape From New York. Watching I Am Legend and Cloverfield back-to-back is kinda cool, too. Bolt: 4 out of 10. I caught Bolt in 3D before it hit theatres and wrote about the 3D experience here. The 3D aspect, although a bit much, was distracting enough to make the first third of this film tolerable. I brought my daughter along and she was thrilled to learn Miley Cyrus was one of the voice actors, but I sensed even she started getting bored as it dragged mid-way through. Elongated drags in animated features have this magic ability to make 90 minutes feel closer to four hours. The pigeons are sort of interesting and the hamster is practically funny, but everything else gives weight to the old adage "there's Pixar and there's Pixaren't." I Am Legend: 7 out of 10. The less you know about this film going in, the better. I didn't know anything about it and I'm a solid year late in watching it. I'm not giving anything away to suggest this movie is worth your time for the special effects alone. The scenes of a deserted Manhattan are pretty awesome. Sure, there are a few plot holes, but ain't those Manhattan street shots cool! Joy Division: 8 out of 10. This documentary on the late 1970s English rock band Joy Division was just what the doctor ordered to get rid of the bad taste Four Christmases left in my mouth. Even if you know the story, this is a riveting retelling of the Manchester bands rise and sudden demise. I watched it last night because I plan to watch Anton Corbijn's Control at some point this weekend. Here's the Joy Division trailer. I highly recommend this doc. Four Christmases: 3 out of 10. I had several issues with Four Christmases, a family comedy starring Vince Vaughn and Reese Witherspoon. First and foremost, this supposed comedy isn't the least bit funny. I think I smiled twice, but I didn't register one chuckle. The writing is weak, the characters are hateful and the primary comedic device for laughter are babies who vomit. If you think a baby vomiting on someone is comedy gold, this is the movie for you! In addition to not being funny, this holiday film isn't the least bit endearing. You never care one iota about these two selfish idiots and their families are even worse. Jon Voight shows up for a pay cheque and gives us the moral of the story, something about the importance of spending time with family, and we learn at the end that this advice was completely ignored. This movie is under 90 minutes in length and it's still way too long and surprisingly empty. There's nothing to take home with you. Absolutely nothing. And plot holes... don't get me started. There are plot holes in this movie you can drive a mack truck through. The entire premise is faulty. In conclusion, this is the worst movie I've seen in a theatre in about a decade that isn't funny, isn't endearing and isn't worth 82 minutes of your precious life. There Will Be Blood: 8.5 out of 10. They should rename this film "The Daniel Day-Lewis Show". It's his movie, in fact, I can't remember a scene without him as the focal point. He's all over this Paul Thomas Anderson flick about a a turn-of-the-century oil prospector and he's brilliant. I'm not a fan of movies in excess of 2.5 hours because it's so tough with two kids to find an uninterrupted block of quiet time that length, but I didn't want this one to end. If you haven't seen it yet, add it to your queue. Now that I've figured out the Lorraine Kimsa Theatre for Young People is the Young People's Theatre I frequently visited in my youth, it was time to share the experience with my own children. Today we saw You're a Good Man, Charlie Brown at the LKTYP. I had never seen this production on the stage so I was surprised by how deep it all was when watched through adult eyes. My four and six year olds just loved the characters, singing and story, but I dug it because there's a pretty cool message in there about the insecurities and doubts within all of us. This really is an ideal family production, with something for everyone, regardless of age. Ok parents, now I'm talking to you. I know what it's like to be restricted by a tight budget for entertainment, but we're talking a weekend matinée for $15 a kid. A piece of junk like Bolt will set you back more after the popcorn and drink. Adults are only $5 more, so you can take two kids to see some great live theatre in the Distillery District for a mere $50. You can buy tickets online at https://tickets.lktyp.ca/YPWeb/default.asp. Ghost Town: 7.5 out of 10. November is almost half over and I just realized I had some free movie passes for the AMC Yonge & Dundas 24 that expire in a few weeks. Reviewing the films currently playing there, I could only find one I'd be willing to commit 100 minutes of my life to, even though that movie was sorted in the dreaded "romantic comedy" genre category. Luckily for me, this romantic comedy was both funny and endearing. Ricky Gervais was the key reason why. Dare I say it was delightful? Heck, I'm just gonna come out and say it. Ghost Town was delightful.